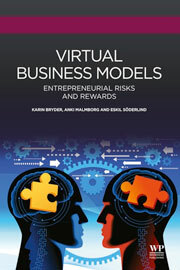 Virtual Business Models: Entrepreneurial Risks and Rewards focuses on companies with technology development, offering inspiration, guidance, and hands-on advice on how to utilize the potential of a virtual company format. The book provides an overview of key aspects of the company's activities, putting them into a comprehensive structure. In addition, both the rewards and risks of using the virtual company format are explored. The virtual company format is here defined as a company with a small dedicated core staff. The company's development is performed by strategic alliances with external resource providers. In this way, the utilization of financial resources can be optimized with cost-effective product development. The book explores this concept and why it is attractive in a start-up phase for both companies who want to remain virtual and those that eventually want to develop into integrated traditional companies.